This is how I start and end each of my lessons for a one hour Kindergarten-1st Spanish class. I start and end the class the same each time so students know what to expect. 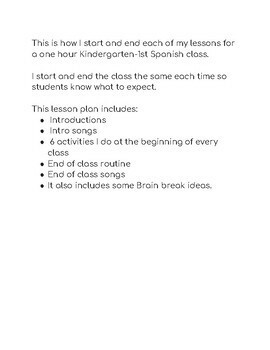 This lesson plan includes introduction, intro songs, 6 activities I do at the beginning of every class, end of class routine and end of class songs. 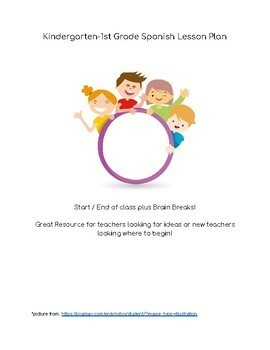 It also includes some Brain break ideas. This is a great resource for teachers who need ideas on how to structure your Spanish class!